World-class mountaineer and renowned author Greg Child once stayed at my apartment while he was in New York, giving a talk at the Alpine Club. I took him to Central Park’s “Rat Rock” and showed him a little climb I’d been working on for six months, but pretended I’d never done. This is known as “sandbagging.” He couldn’t do it. So for nine feet, I out-climbed the great Greg Child, conqueror of many Himalayan peaks. However, lacking the true outdoorsman’s overabundance of restless energy, my climbing career dwindled, and I settled for becoming a world-class armchair climber (writers are reading addicts). Therefore, knowing well the history of the mecca for U.S. cutting-edge rock climbing, and being one degree of separation from John Long, who provides commentary in the film “The Dawn Wall,” I can vouch for the goings-on in this spectacular climbing documentary. 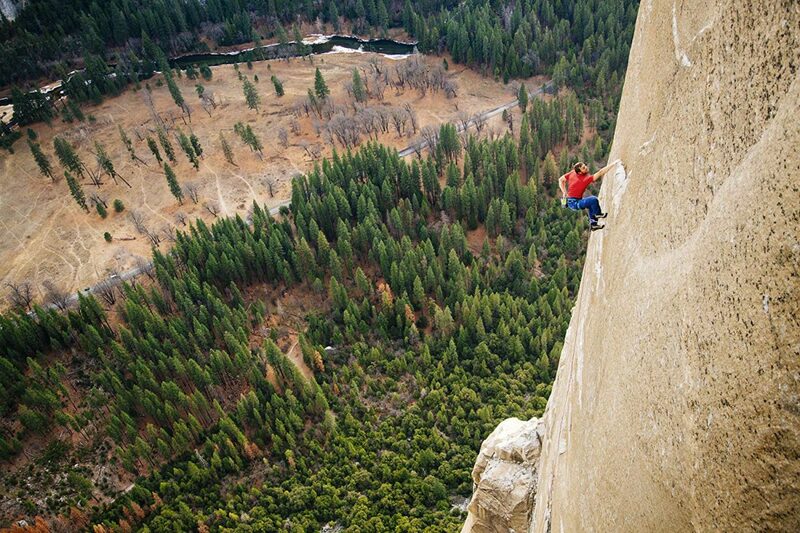 It’s a tale of superhuman effort by two modern supermen—Tommy Caldwell and Kevin Jorgeson—and is truly astounding. Hopefully, I can do justice to the magnitude of the heroic climbing feats herein. Yosemite Valley was for a time the hidden location of the last vestiges of America’s Wild West, where the romantic spirit of gold prospecting and pioneering still lingered into the early 1980s. The Valley’s notorious Camp 4 harbored a close-knit community of hyper-competitive, bandana-wearing hard men, sporting granite abs, huge lats, giant forearms, and the grip-strength of gorillas. They put up death-defying rock-climbs named “Lost Arrow Chimney,” “Snake Dike,” and “Tangerine Trip” and were a rowdy bunch of Jimi Hendrix-listening, weed-smoking, acid-tripping hippie-jocks. Now, John Long in his day was one of the quintessential pioneers to climb El Capitan, Yosemite’s most famous granite monolith. Warren Harding put up the most famous climb on El Cap, “The Nose,” in 45 days. The second ascent took seven days. In 1976, John Long, Jim Bridwell, and Billy Westbay were the first to climb the 3,000 foot “Nose” in a day. It stunned the world. To give you some perspective on Tommy Caldwell, he and climbing-freak-of-nature Alex Honnold recently obliterated Long’s record. They ran up “The Nose” in 2 hours. Long wrote a book called, “Rock Jocks, Wall Rats, and Hang Dogs.” Wall Rats lived up on the great valley rock walls for weeks at a time, engaged in mind-bogglingly dangerous technical climbing, thousands of feet in the air. Visualize that for a second: imagine banging a piton the size of a postage stamp into a paper-thin crack in the granite wall. Then you attach a nylon sling to it. Then, you test it—by stepping onto the sling. It might hold. It might also immediately pop out and send you screaming on an 80-foot, cart-wheeling fall, which might also easily pull out the entire line of pitons you’d banged in to arrest such a fall, and lead to, well, death. The opposite of big wall-climbing is “bouldering.” Climbers who specialized in doing short routes, sticking to the giant boulders at the base of the cliffs—three feet off the ground. But hanging off razor-thin holds (with heavily calloused fingertips and sticky-rubber-soled climbing shoes) so marginal that you’d need a magnifying glass to see them. It‘s a spectacularly gymnastic, balance-oriented pursuit. Got those two extremes firmly in mind? “The Dawn Wall” is the story of the last-standing, crown-jewel big-wall climb on El Cap— The Dawn Wall, where every pitch (a pitch is a rope-length, roughly 150 feet) is composed of beyond-expert bouldering moves—with thousands of feet of yawning exposure underfoot. For 19 days. Sleeping on the wall in porta-ledges (a combination of cot, tent, and rain-fly that hangs off the side of cliffs). John Long himself sits there, visibly gob-smacked by the very thought of it. It was once considered absolutely un-free-climbable, but on Jan. 14, 2015, Caldwell and bouldering specialist Kevin Jorgeson sent it. It kicked off an international media feeding frenzy, which, mostly through ignorance, showered the world with fake news, claiming the whole ordeal took only a few weeks. The true facts are that it took years of preparation and dedication. It’s a story of lost love and manhood gained. Young Caldwell, unfairly referred to at one point as a “climbing savant,” (he wasn’t a good student, like few athletes capable of hyper-focus tend to be) and his climbing partner and wife-to-be, Beth Rodden, had already been a well-meshed team for quite a few years. As sponsored world-class climbers, they, naturally, climbed worldwide; and a trip to Kyrgyzstan led to Caldwell, Rodden, and two others getting taken captive by rebel soldiers. They escaped when Caldwell seized an opportunity to throw their gun-toting captor off a cliff. As explained in the movie, this trauma eventually fostered a psychological dependence by Rodden, on husband Caldwell, which turned to resentment, and she ended up leaving him. It’s a hallowed theme in mountain-climbing storytelling that climbing serves as a fabulous antidote for heartache. 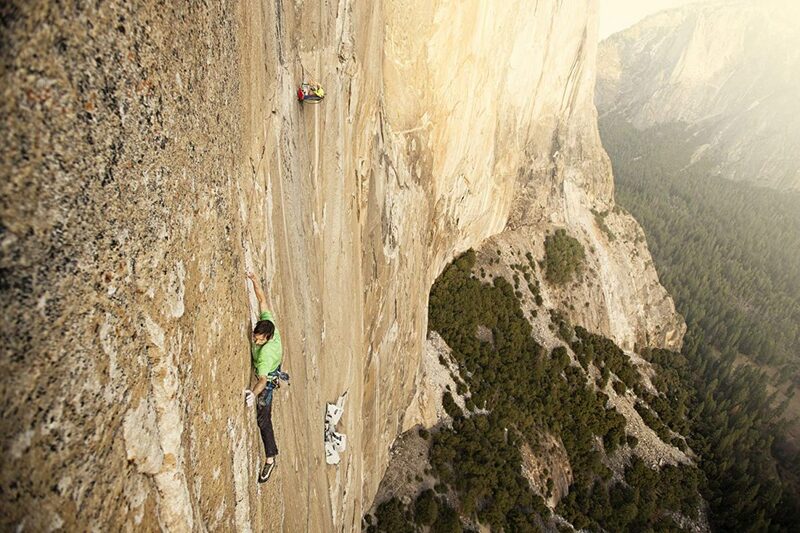 And so the Dawn Wall project hove into view as an act of desperation for Caldwell, really. Caldwell threw himself into years of hang-dogging (coming down like a spider on a rope from the top of a cliff) to do route inspection and finding the hidden pathways of cracks and hold sequences that lay hidden in the vast oceans of smooth, blank, vertical granite. An additional ordeal: In the midst of some power-tool carpentry, Caldwell sawed off his index finger. “You’ll never climb again,” said the doctors. Yeah, right. Like Adam Brown of SEAL Team 6, who got his eye blown out, only to re-train himself to shoot just as well left-handed, Caldwell ends up climbing better than before. John Long has described big wall climbing as a rite of passage that will leave boyhood behind like so much shed snake skin. The definition of a manhood rite of passage is that a boy must face an ordeal he doesn’t think he can overcome. Caldwell was already tough—his bodybuilder/climber dad taught him resilience at age 6. Consider the irony of this statement: “This (climbing) has always been my safe place, my way to deal with life.” Hanging with fingertips high enough to where massive pines on the valley floor look like gray-green washing-machine lint—that’s Caldwell’s safe place. So really, it was Kyrgyzstan that was Caldwell’s rite-of-passage to manhood. He said those six days were profoundly depressing, but that something eventually shifted in him, and he became tempered. Caldwell, the “climbing savant,” needed something even more intense to reach manhood—killing a Taliban rebel to save his fiancée and friends’ lives. The film’s never boring. It’s a literal cliff-hanger the entire time. Directors Josh Lowell and Peter Mortimer do justice to the other reason climbers climb in Yosemite—the stunning nature. But the main focus is the tension between the you-are-there climbing footage, and the interviews with Caldwell, Jorgeson, Long, Beth Rodden, Caldwell’s dad, mom, friends, his current wife. Then there’s baby Fitz Caldwell. Little Fitz is filmed demonstrating a high degree of tenacity, executing a mantling move, on a small boulder, at the age of 1. The way things are progressing, watch for Fitz to free-solo (no rope) dad’s Dawn Wall when he turns 16.